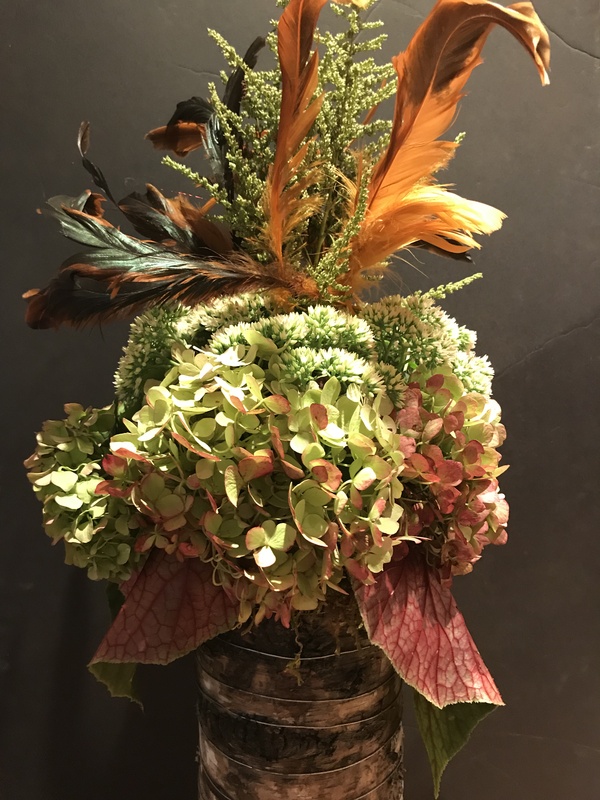 For the bar area I created a tall arrangement in a birch bark container using astilbe, sedum, hydrangea, upside down begonia leaves and feather clusters in autumnal colors. I started with a tight bundle of astilbe. I then wrapped sedum around their stems. Next came a crown of hydrangeas just beneath the sedum. 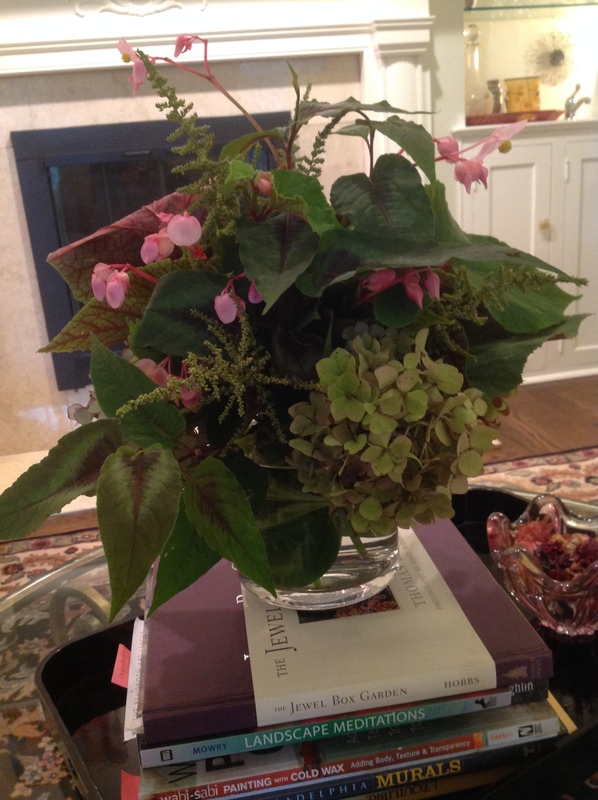 I finished the arrangement with upside down begonia leaves for their striking pink color. I just gathered the flowers in hand and tied the stems together with an elastic band to keep the arrangement tight. I stuck the feathers in last. This is my favorite creation by far. Doesn’t it look like it came from a high end florist? 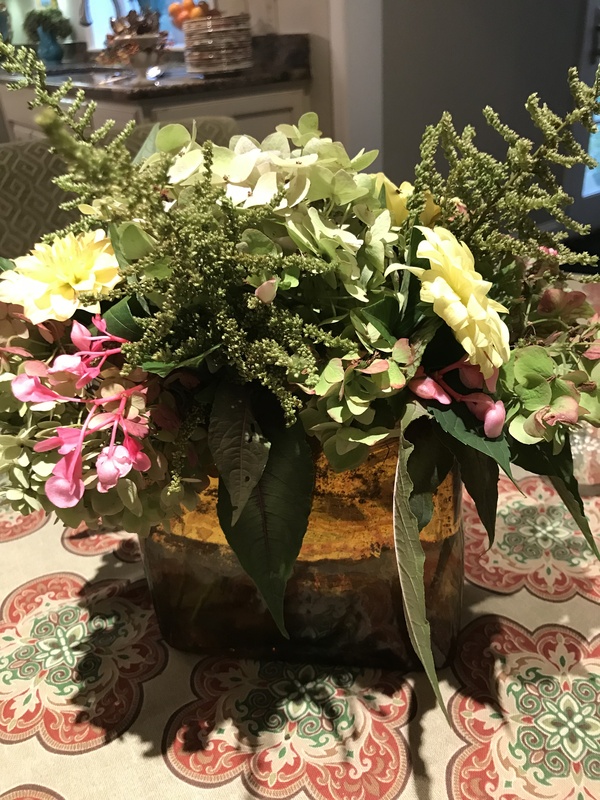 For a table centerpiece, I arranged hydrangeas, dahlias, persicaria, begonia flowers and astilbe fronds in an amber rectanglar vase. 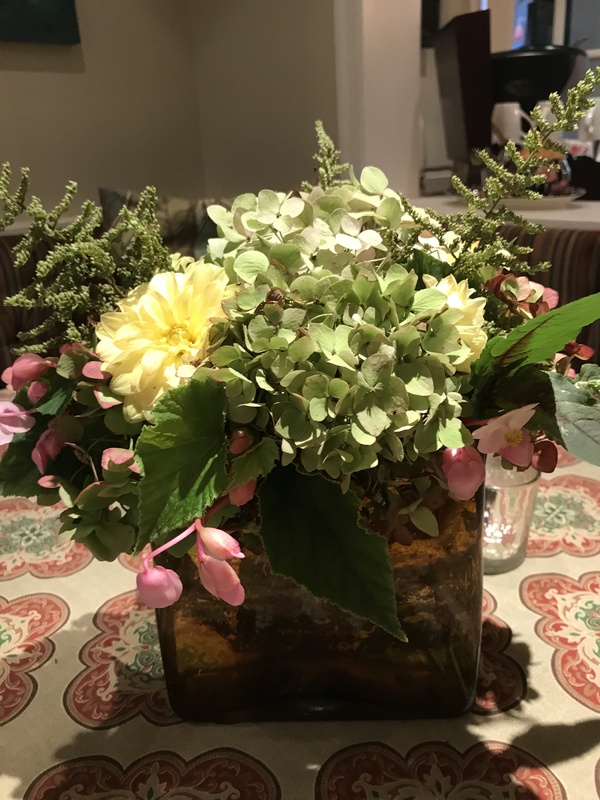 A more romantic arrangement, totally different in feel than the nearby bar one yet complimentary with many of the same flowers and foliage reappearing. 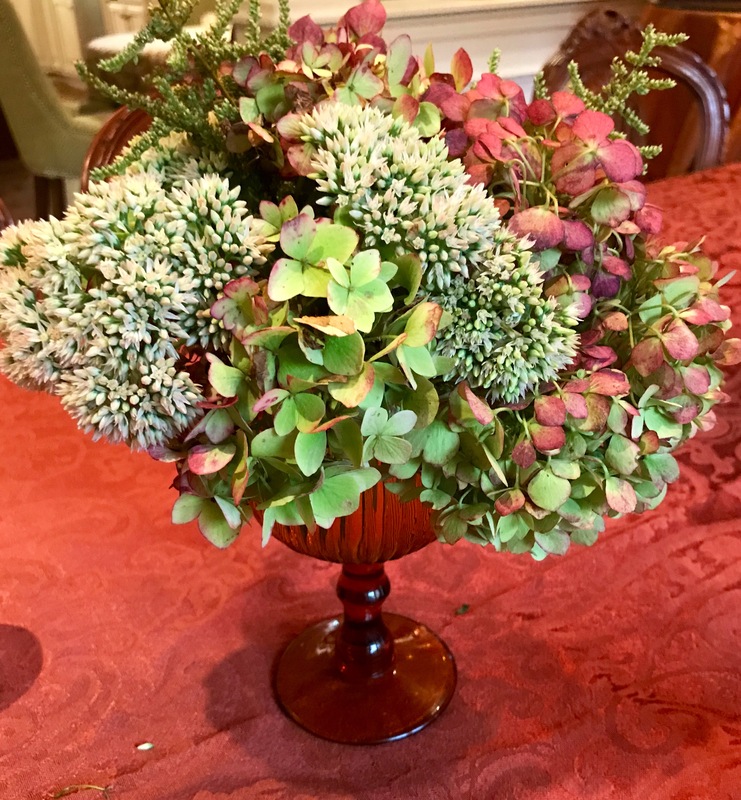 On another table, I used a trio of stemmed amber wine glasses filled with hydrangeas, sedum and seeded astilbe, each secured with an elastic band. Simple, classic and pretty in multiples, surrounded by candlelight votives. On a cocktail table I used a contemporary clear glass vase and arranged hydrangia, begonias for both the flowers and the foliage this time, some astible and trailing persicaria, secured by an elastic band. I wrapped the stems in a lime green hosta leaf for a modern arangement and to conceal the elastic band. 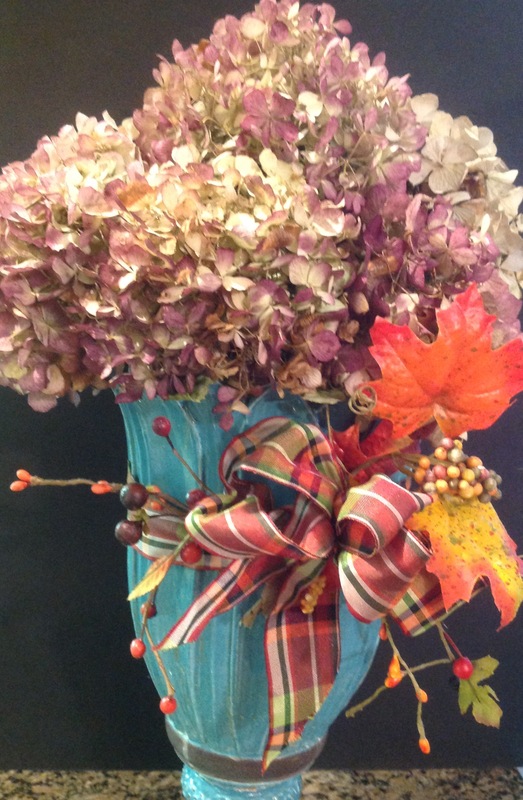 In the kitchen, a tall urn was filled with dried hydrangeas. 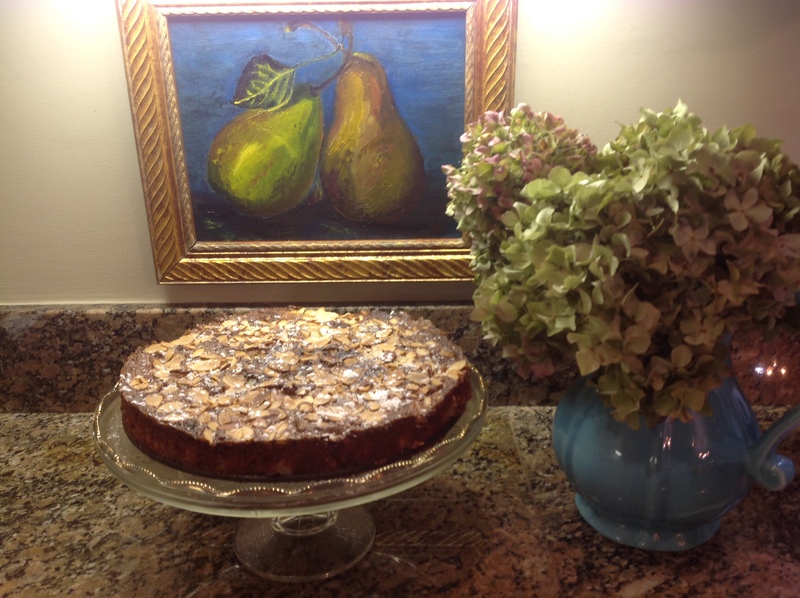 A plaid ribbon, silk fall leaves and berries added decorative accents and more color to compliment the kitchen décor. The dried hydrangeas will last for months. 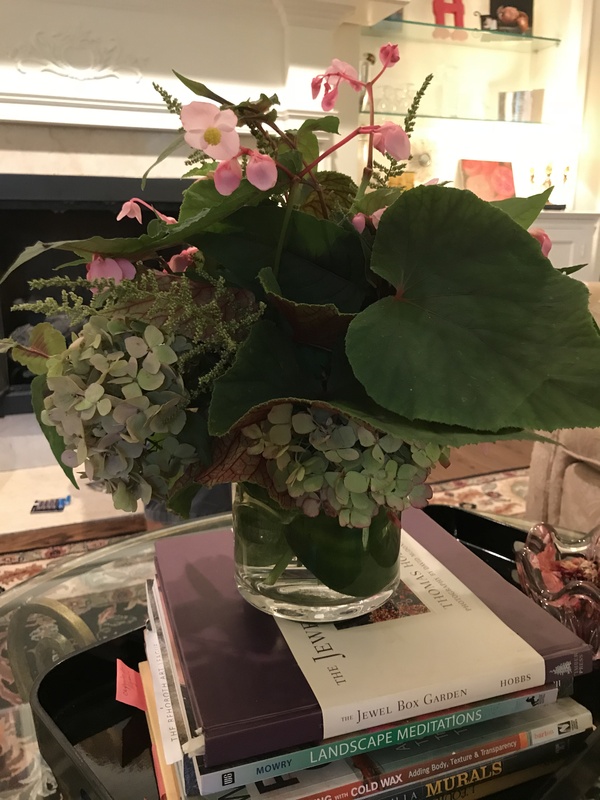 On the dessert buffet table, I plopped a bunch of hydrangeas in a pitcher for a charming but simple arrangement. And the single rose? It graced the powder room in a bud vase. A house filled with beautiful, seasonal flowers, at no cost: priceless! What’s blooming in your fall garden? 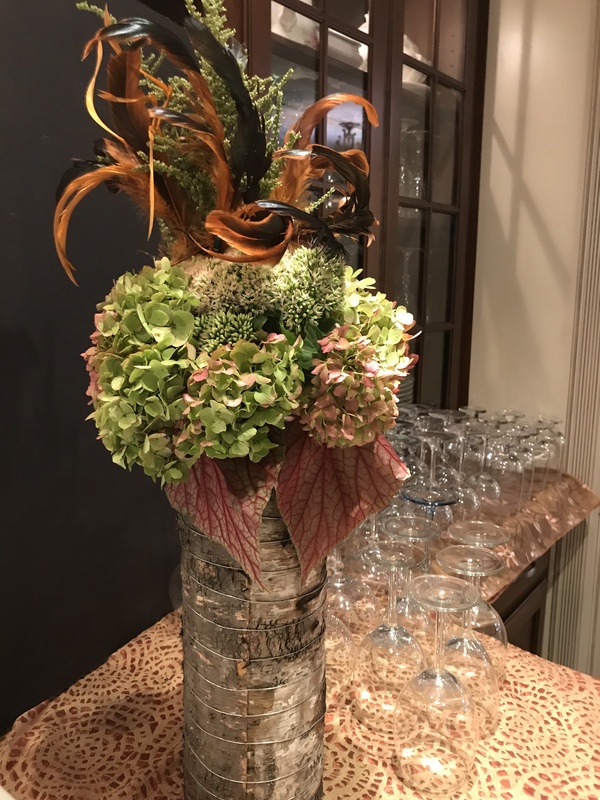 This entry was posted in Entertaining, Gardening, Home Décor, Tablescapes and tagged astilbe, entertaining flowers, fall arrangements with garden flowers, fall centerpieces, Foraging fall flowers for centerpieces, Hardy begonias, hydrangeas by Johanne Lamarche. Bookmark the permalink.